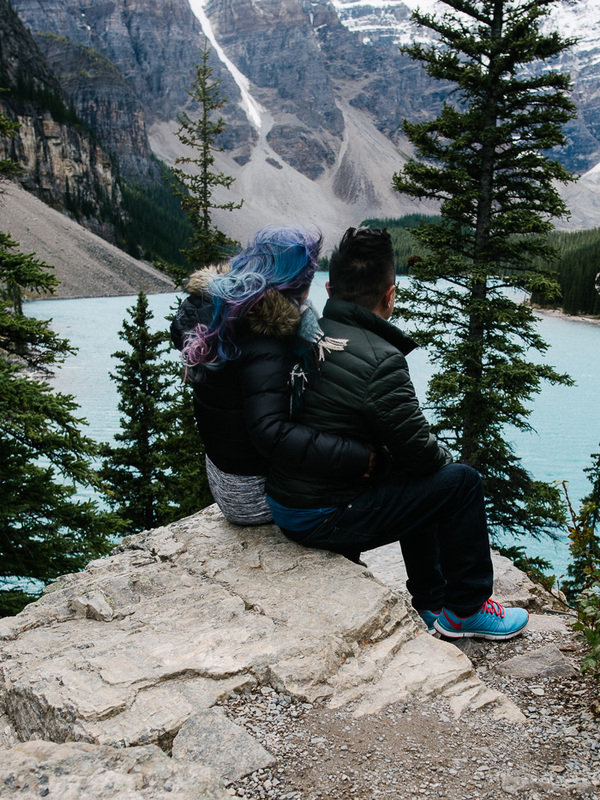 We went to Banff and it was banff-y and beautiful! It’s funny, but I’m not very well traveled in terms of Canada. I’ve never been to Montreal, Toronto or Prince Edward Island. 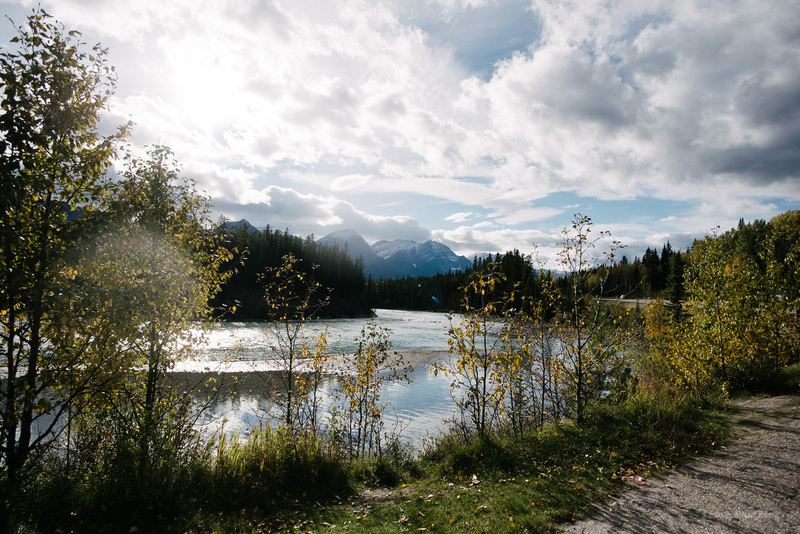 And until a couple of weeks ago, I had only been to Banff once, when I was very young. 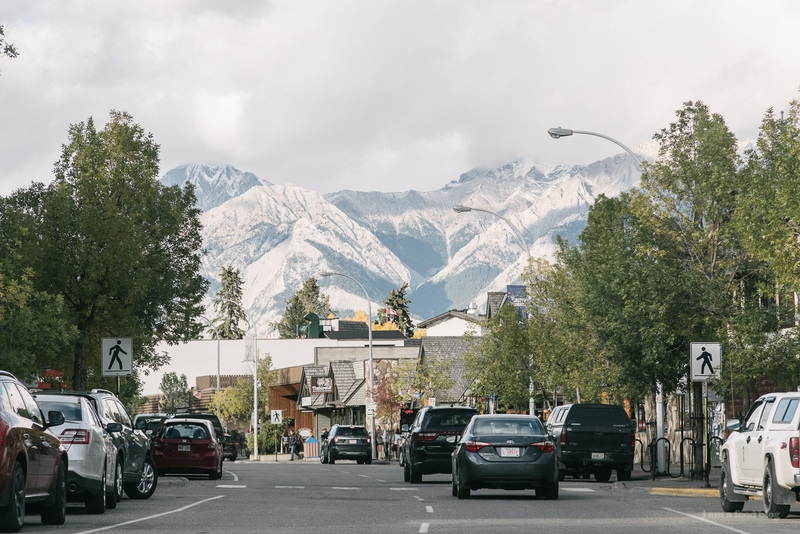 Mike was pretty surprised because apparently Banff is a quintessential “I’m in my early 20s” road trip for Canadians. 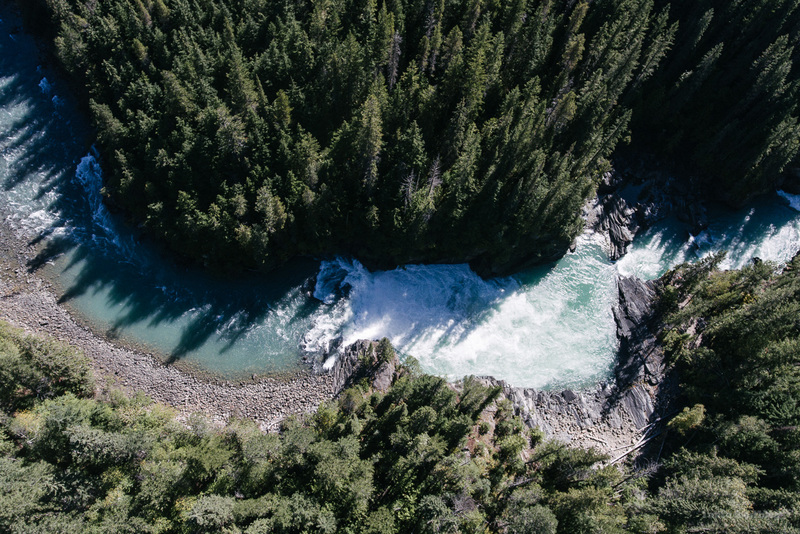 It’s far enough from Vancouver away to be a destination and close enough to be a weekend trip, making it ideal for a quick getaway. To be honest, now that I’ve been, I can’t believe that I haven’t been before either. 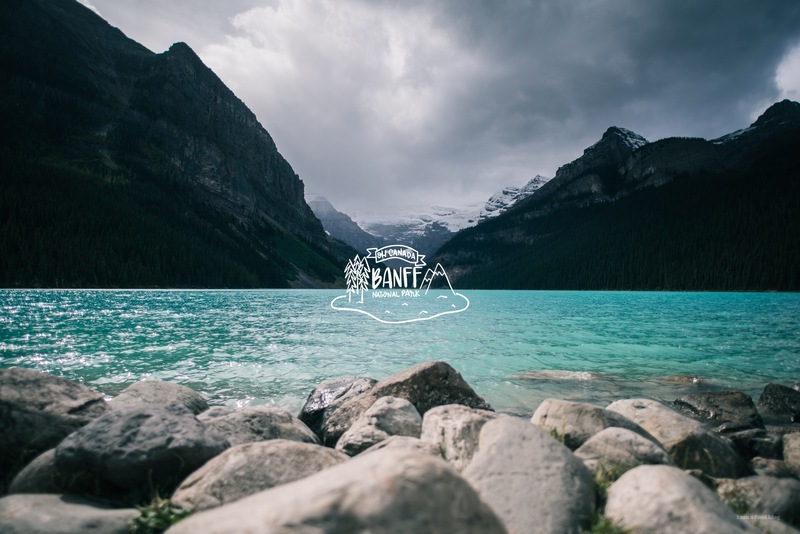 Banff is full of gorgeous glacial lakes, endless evergreen forests, and majestic snow dusted mountains. It was one of those trips where we didn’t plan anything, other than booking a cute cabin to stay in, and it was almost perfect in its casualness. For once we didn’t look up the best place to eat or must-sees. We just stopped where the road took us: those magical blue lakes. I don’t know if you’ve seen pictures of them – they’re almost an unreal, ethereal blue, due to light reflecting off of a massive amount of rock flour (fine grain glacial rock erosion bits). It isn’t really fair to call them blue – they’re more than that, changing with the weather from a milky opaque cyan to azure to cerulean. I built them up in my mind, thinking that maybe they wouldn’t actually be as blue as all of the photos I’ve seen floating around the internets, but they ended up being straight-up, hashtag-no-filter, as blue as I dreamed. 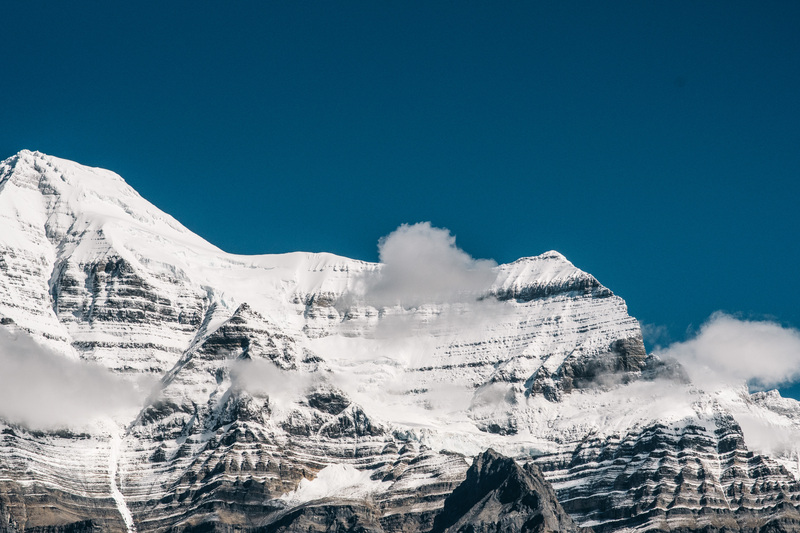 The first day we went to Moraine – which, by the way is not as popular as the more well known (possibly due to alliteration) Lake Louise – it was a breath-taking milky pale blue. It was also crazy windy. Mike wanted us to go out on the lake in a canoe, but after seeing the choppiness, I said, hells no. And, there was no canoeing anyway, seeing that the canoe rentals were closed due to the inclement weather. I had whipped myself up into a frenzy, telling Mike that there would be no way that I would go out on the lake, not in this life time, not ever. 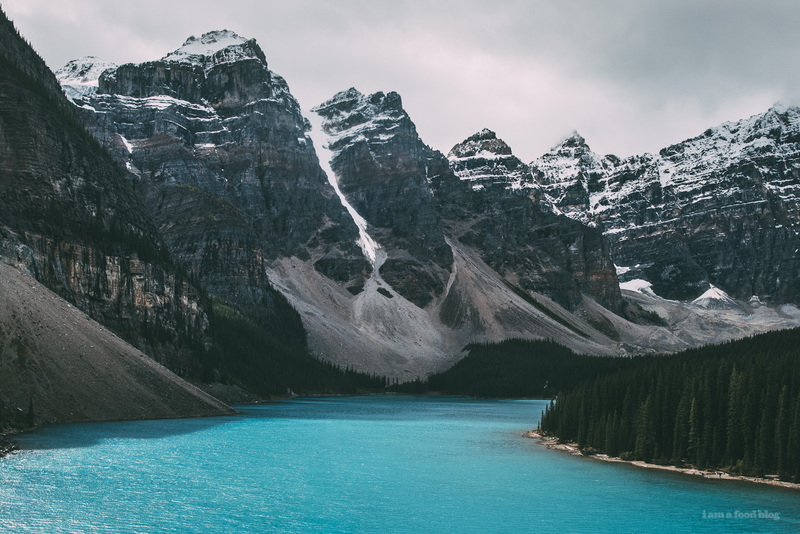 But the next day, the skies cleared just a bit and the lake calmed into a glassy basin of blue surrounded by snow capped mountains. I couldn’t resist. In the end, Mike was absolutely right, it was a once in a life time moment, being on a glacial lake, the water blue beneath us and the mountains hugging in close, as good friends are wont to do. 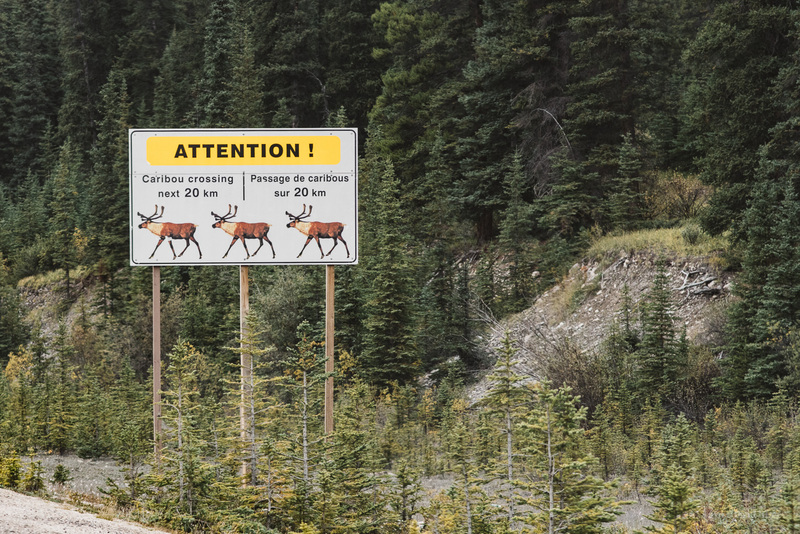 It was a very Canadian trip, complete with a bear sighting, a sprinkling of snow, and endless ribbons of highway. I’m pretty sure we’ll be back. Thanks for being fabulous Banff! PS – Mike and I just started another blog, Space to Call Home, so if you’re interested in Mike’s side of the story, as well as more photos, check it out! I’m really excited about Space (as we fondly call it). I’m going to be contributing more ramble-y slice of life posts and Mike’s going to be doing lots of in-depth long form features. 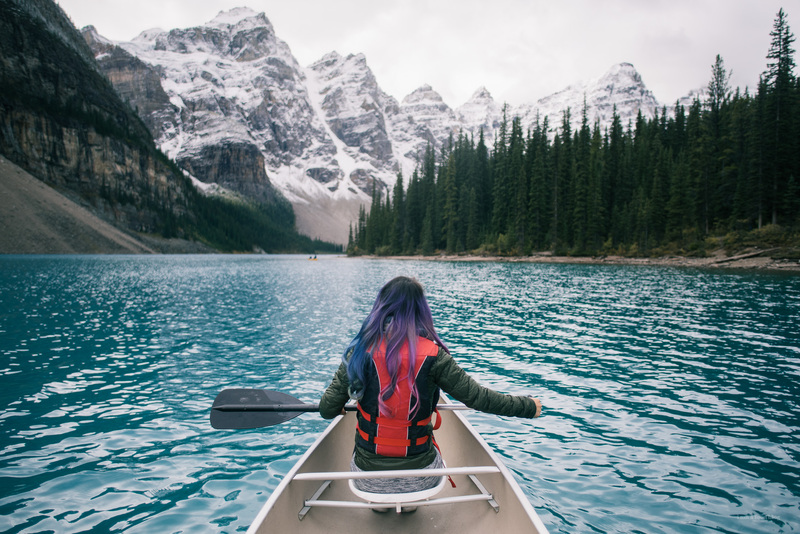 PPS – We totally took our SLR our on the canoe, rowed out to take a couple of shots, then rowed back to ask the attendant to keep it behind the rental desk. Because even though the slightly above freezing water was okay for us, it definitely wasn’t okay for our camera. Priorities, amirite? I’m absolutely in LOVE with these photos! I thought the water was blue in the streams in New Zealand, well, I think this tops that by far. So gorgeous, I want to go there now too! This looks totally stunning, S! And congrats on Space! gorgeous! 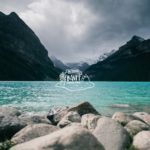 I haven’t been to Banff since I was a kid. Need to make that trip again. I have the same thoughts about Canada, and after being in Vancouver recently, totally have the bug and Banff is very high on the list! Yay! So pretty! My sister got married in Banff last winter… and we ice skated on Lake Louise. What a lovely place. I’d love to go back in the summer or fall! Glad to see you enjoyed it! Happy to call this place home. Canada is such a babe! Gorgeous, incredible photos. Your travel photos always make me cry, Steph. 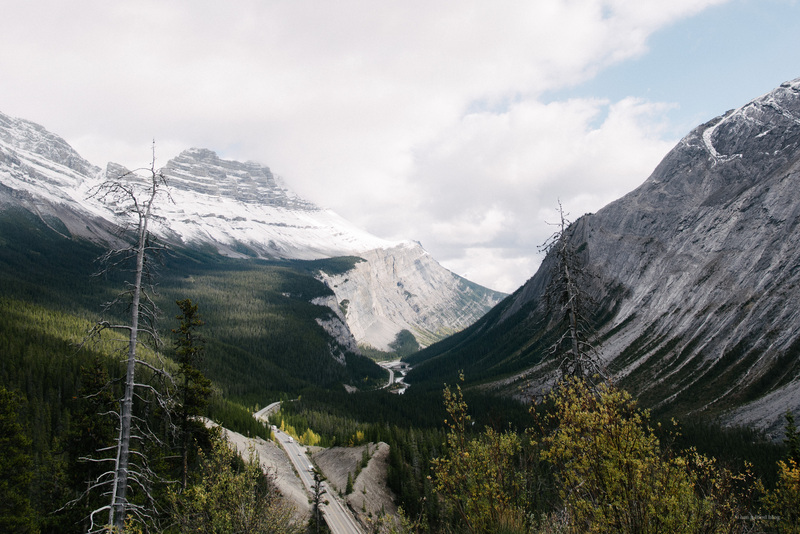 These are just stunning—I can’t wait to explore Banff myself sometime soon. What a fun adventure. AND YAY SPACE! Excited to discover all that’s over there. What a amazing views! A few years ago I’ve been to Alaska and these pictures remind me time I sepnt there. Thanks for posting these pics. Such beautiful photos! That water is ridiculously blue. 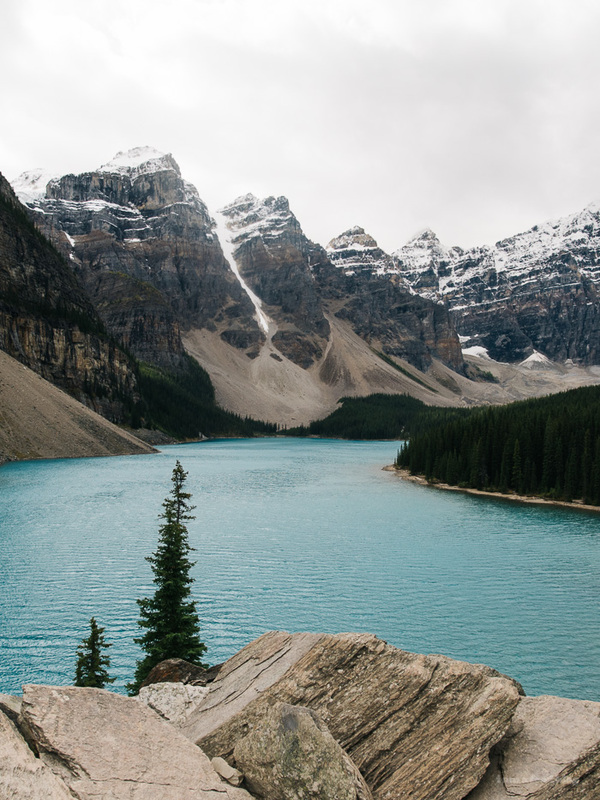 Definitely going to add Banff to our travel destinations list! Wow gorgeous photos! I’ll definitely have to visit next time I’m in Canada! Mike’s blog is so nice & it’s fun to see another perspective on your trip! Wow, these photos are breathtaking.